Music star Stevie Wonder recently filed for divorce in Los Angeles from his wife of 11 years, Kai Millard Morris. Although the couple has been married since 2001, they reportedly separated in 2009. Wonder, whose real name is Stevland Morris, cited irreconcilable differences as the reason for the couple’s split. In his petition, he reportedly agreed to pay an unspecified amount of child and spousal support and asked the court to award him joint custody of the couple’s two children, 10-year-old Kailand and 7-year-old Mandla. Although Wonder amassed most of his fortune prior to meeting his wife in 1999, some of the couple’s assets will likely be split due to California’s community property laws. According to California law, any assets earned during the course of a marriage are shared equally among spouses in the absence of a premarital or other agreement to the contrary. Additionally, the couple will likely not be required to share any assets earned after they separated. Although no one likes to think their marriage will end in divorce, this case is just another example of a couple who likely would have benefited from entering into a prenuptial agreement. In California, a premarital agreement is a contract entered into by a couple prior to marriage. A premarital agreement will normally outline any spousal support or property division obligations in the event of a divorce. In California, a prenuptial agreement must meet stringent criteria and may not address child custody and support obligations. Judges will normally look to the California Family Law Code when determining whether a prenuptial agreement is enforceable. If you are considering entering into a premarital agreement in the State of California, you should contact an experienced family law attorney to discuss your rights and help you protect your financial interests. Getting divorced is often a stressful and emotional time. You are likely to have a host of questions about child custody and support, alimony, property settlement agreements, name changes, and many other family law matters. A skilled California family law lawyer can help. If you facing a divorce or another difficult family law matter, you should contact Doppelt and Forney, APLC . Mr. Doppelt is a dedicated Encinitas family law attorney who has more than 20 years of experience guiding clients through the legal separation and divorce process in California. He also helps clients negotiate premarital and property settlement agreements. Mr. Doppelt is available to assist you with all of your child custody, child support, alimony, adoption, and other family law needs. Doppelt and Forney, APLC serves clients in Linda Vista, Scripps Ranch, San Diego, Encinitas, and throughout Southern California. 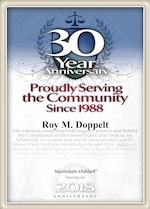 To schedule a free confidential consultation with a committed family law attorney, do not hesitate to call Doppelt and Forney, APLC toll-free at (800) ROY IS IT (769-4748) or contact us through the law firm’s website.